Sift the flour and baking powder together into a bowl. Make a hollow in the centre and add an egg. Gradually add the milk, until all the flour is worked in and the batter is smooth. Add the sweetcorn and seasoning and mix together. Lightly oil a frying pan and heat until hot. Ladle in spoonfuls of batter to create pancakes approximately 4cm in diameter, then cook for one or two minutes each side or until firm and golden brown. Keep the pancakes warm in the oven until they are ready to serve. Grill the bacon until it is crispy. 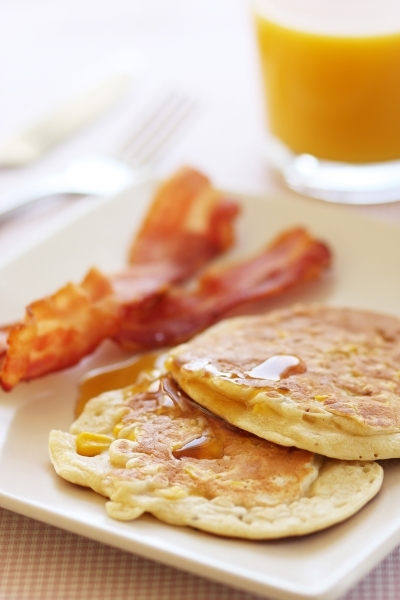 Serve the sweetcorn pancakes with the bacon and maple syrup. Canned sweetcorn gives us the golden pigment zeaxanthin, which is good for eye health. It’s also convenient to use, and can be eaten straight out of the can.